999 Call for the NHS aim to stop a new form of NHS contract that could threaten patient safety standards and restrict patients’ access to treatments. We're about to launch Stage 5 CrowdJustice ! If you are visiting this page please know that we are still marching to the Courts! But this is under threat from plans for new local NHS and Social Care organisations to operate with a contract based on fixed, pre-set budgets that cover an area’s population. Since this contract does not link payment to the number of patients treated and/or the complexity of the medical treatment provided, it fails to ensure that there would be sufficient money to meet the cost of delivering NHS services to the required quality standard. In early August, NHS England published a model contract for these new local NHS and social care organisations (known as Accountable Care Organisations). We believe that this contract is unlawful under current NHS legislation. The Accountable Care Organisation Contract would make this situation worse. We have to challenge this. We are opening Stage TWO of this appeal because we are now asking the court for permission to bring the judicial review. 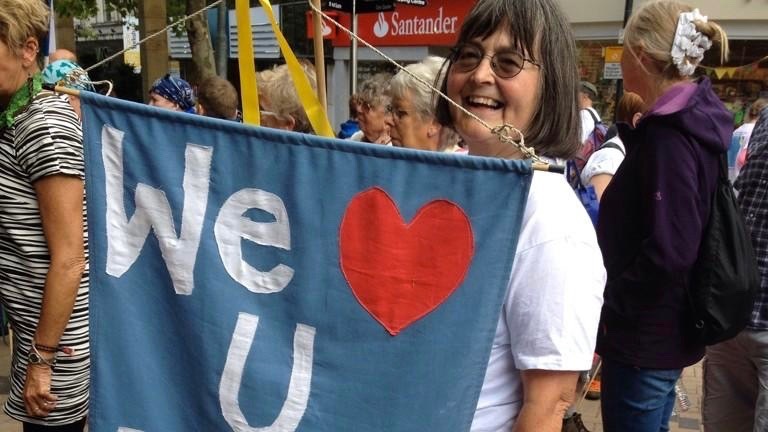 Like many others, we’re ordinary people with a passion to protect the NHS as a high quality comprehensive public service, free at the point of use for all who need it. 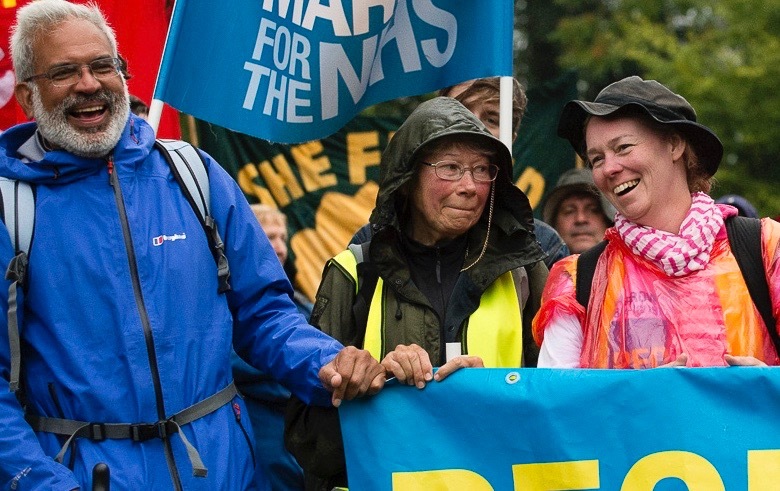 In 2014, with support from the public, local press and media, 999 Call for the NHS marched 300 miles from Jarrow to London to save the NHS. Over 20,000 people gathered in Trafalgar Square to support this urgent call. We’ve carried on campaigning ever since. Stage ONE of our appeal raised funds to pay for public law firm Leigh Day to investigate grounds for a judicial review. That work has led to Stage TWO. We are now bringing a claim for judicial review against NHS England, on the grounds that it is unlawful for new local NHS and Social Care organisations called Accountable Care Organisations to operate fixed, pre-set budgets that will cover an area’s population. This type of contract is not allowed under existing Health and Social Care legislation. NHS England’s publication of this new contract is timed to enable eight Sustainability and Transformation Partnerships to become Accountable Care Systems from next April - an example many others will soon follow. At the same time, the NHS hospitals regulator, NHS Improvement, is working out how to licence non-NHS organisations as Accountable Care Organisation contract holders. We want to bring this judicial review because we are clear that under this new form of contract, our NHS would no longer provide high quality health care for all of us. Like most people, we manage to keep a roof over our heads and food on the table - but if patient safety and access to the full range of NHS care were threatened by this Accountable Care Organisation contract, we certainly could not afford to pay for private healthcare. The key asset of the NHS, when doctors and nurses treat you, is that you are a patient in need of care - not a money machine to generate profits for their organisation. For those of us who work in the NHS, this is at the heart of our sense of vocation and purpose. This Judicial Review may be one of few chances to save the NHS as the source of good quality comprehensive healthcare that puts the patient first. The exact figures: Thanks to a tremendous response from 463 backers, ourStage One Crowd Justice appeal raised £11,318.09,after administrative costs were deducted. 999 Call for the NHS also has approximately £4,000 reserved for the judicial review . Altogether, this adds up to around £15,318.09. This is the breakdown of the £25,000 judicial review costs. We will ask the Court to cap our costs at £15,000, since this case is in the public interest. This limits what we’d have to pay if we were to lose the case. £5,000 to pay for general campaign costs - travel, publicity etc - we are all volunteers. We initially investigated one particular Sustainability and Transformation Plan - West Yorkshire and Harrogate - on the grounds that anything unlawful in one would be unlawful in all 44 Sustainability and Transformation Plans. This is why we are bringing the Judicial Review against NHS England. Now the threats to our NHS mean that we must continue marching. This Judicial Review is a big step for us - we need your help. This is a vital matter of public interest. The more we stand together, the better our chance of protecting our NHS. Good luck, hope you achieve everything! Thanks so much to everyone who has donated, sent us messages of support and shared our case with campaigners up and down the country. Please keep helping - we really appreciate all your help. Now we need to raise the remaining £12k to meet the Capped Costs Order granted by the judge. It's all explained in our Stage 3 page. Thanks everyone. Here's to making this happen. Happy & Hopeful 2018!! That's what we are aiming for. Please standby for the launch of Our NHS - Comprehensive Healthcare for all - STAGE 3. This Friday 12th January 6pm. We need another £12k in order to meet the £25k Capped Costs Order (CCO) that the Judge granted us. This limits the amount of money we have to pay if we were to lose the JR.
We're told CCOs are not granted lightly. We hope you can can help us. It's not just about donating. Thanks everyone who has supported us this far. On Thursday 21st December our lawyers, Leigh Day, informed us that a judge had considered our papers and those of NHS England... and granted permission for our JUDICIAL REVIEW to go ahead - some time after 16th February 2018! This is wonderful news and a real present just before Christmas. The Judge has also agreed to a Capped Costs Order (if we lose what we have to pay) of £25,000. This is more than the £15,000 we had hoped for but the fact that the judge has agreed to this shows that they consider it to be in the public interest for our case to be heard. We will be issuing full details after Christmas as we will need to raise another £12,000 to cover the £10,000 extra capped cost and some small additional costs. We sent our papers to the Administrative Court around a month ago. Theses statements explain our claim to bring the Judicial Review against NHS England on the grounds that we believe their draft Accountable Care Organisation contract is unlawful. NHS England’s lawyers sent our lawyers their response to our claim (and also sent to the court). NHS England made it very clear that it is not best pleased at our challenge. There has been a second round of exchanges between us and NHS England, via lawyers, and these documents have also gone to the court. The Judge will read all this before deciding on a hearing of our claim for a Judicial Review. You did it and helped us to reach our target! We really appreciate every donation no matter what size.We are now talking with the lawyers about the next steps we are about to undertake. We'll be in touch with backers who have signed up for updates. If you would like to be kept informed and become a part of the Judicial Review campaign visit our website page for more details. Did we say "thanks"? THANKS!!! Thanks to everyone for your messages of support and good will. We are near the finish line but we still need one final push to help reach our full target. We would especially like to thank the team from Save Our NHS Barnsley who held a brilliant event in the town. We spent the day talking to local people about what the Accountable Care Organisation model meant for them. You can watch Our Steve giving a speech on a video which has been watched by over 13,000 people. It seems to have resonated with people. We are in Barnsley - Sat 28th Oct.
999 Call for the NHS will be in Barnsley. Steve is speaking at the NHS Rally to lend support to Barnsley Save Our NHS who are fighting in their local area the very thing we are challenging in the courts - they are part of South Yorkshire & Bassetlaw STP which is being fast-tracked to become an Accountable Care Organisation by April 2018. Steve can discuss the realities of fast-tracking ACOs, what they are seeing on the ground, with the local campaigners. As well as Barnsley locals, Steve will be joined by campaigners from Lincolnshire, Liverpool, Preston, Huddersfield, Nottingham and Leeds. We'll try to collect photos and video comments.